The award seeks to recognize outstanding achievement in the development and implementation of public/private cooperation in public safety. This award recognizes agencies who have demonstrated outstanding achievements in cooperative efforts in public safety. 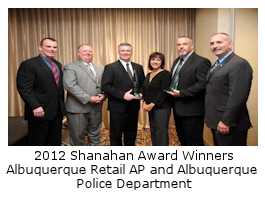 In 2012 they recognized Albuquerque Police Department and the Albuquerque Retail Assets Protection Association (ARAPA) for leading the development of "social Media" web based technology - Community Oriented Notification Network Enforcement (CONNECT) and developing a model that was replicated in 20 different jurisdictions. And this year they recognized the Houston Police Department’s Greater Houston Loss Prevention Alliance who will receive the award at a special event at the IACP Annual Conference in October. The Michael Shanahan award, won internationally, recognized the Houston Police Department's efforts, with major retailers alongside them, on combating retail theft and raising awareness to the community in which organized retail crime affects. Assistant Chief Dan Perales, chairman over the Positive Interaction Program, spoke with the Daily to tell us how much the program was having an impact on the community. "The Positive Interaction Program was designed as an outreach to the community" he told the Daily. The Greater Houston Loss Prevention Alliance was created under the Positive Interaction Program, and at only four years old, is running as strong as ever. This alliance is formed of nine major retailers: Wal-Mart, Target, Walgreen's, Randall's Grocery, H.E.B, Kroger's, Fiesta Grocery, CVS, and Family Dollar, and with a police-retail business combined effort, works under the founding premise of "remove the OPPORTUNITY for crime to occur through citizen awareness." By utilizing media, they strive to educate and provide the means for Houston community residents to realize potential crime exposure when visiting retailers, combat retail theft and make sure they do not become a victim of theft themselves. Officer James Sobota, Citywide Coordinator of the Positive Interaction Program, and Brian Hall, Senior Area Loss Prevention Manager of HEB and Chairperson of the Greater Houston Loss Prevention Alliance, wanted to take a closer look at retail theft, and expand the organization to impact retail businesses. They worked together and called other retail businesses to form the Greater Houston Loss Prevention Alliance that focused on grocery and retail stores selling food and prescription drugs. Brian Hall told the Daily, the mission for the GHLPA is "retail loss prevention members working together with community and law enforcement to reduce retail crime." The organization especially campaigns during the holiday season where organized retail crime is most active, and came up with the slogan, "Safe Shopping Starts with You." This slogan embodies their efforts to remind the public to take responsibility in combating retail theft, and helps them become aware of behaviors that may cause theft to occur such as leaving a purse in a car or shopping cart. During the summer, Officer Sobota explained to us, the alliance provides child safety reminders, especially concerning leaving children in vehicles. They also work on child identification programs such as fingerprinting children to keep their personal information handy for law enforcement and parents. Recently, Brian Hall told us, they have introduced an innovative electronic case sharing program to retailers. "Now, retailers can share major criminal events with basic suspect information, description and photos at their stores and better support HPD in apprehending suspects." Brian Hall also mentioned that in early Fall HPD and Crime Stoppers will take part together in an ORC awareness program which will focus on educating consumers and citizens of what Organized Retail Crime really is. The focus of GHLPA has been on customer and citizen safety, however within the past twelve weeks, GHLPA has just started to make the turn into focusing on organized retail crime as it progressively gets worse. "We want to catch the bad guys but also tell the citizens about ORC. If it's too good to be true, it could possibly be stolen goods," he mentioned to the Daily. Assistant Chief Perales told the Daily he was very honored that the program was receiving the award, out of hundreds of other submissions. Officer Sobota also commented, "Keeping the communities safe has paid off. When people ask me how are we doing what we're doing, I tell them it's not just about being reactive. You have to be proactive." The Houston Police Department and Greater Houston Loss Prevention Alliance will receive the Michael Shanahan Award on October 19 in Philadelphia at the IACP gala. Congratulations!